The LEDs are an extraordinary invention, and even more so when, thanks to the discovery of new materials for their realization, it was possible to build the blue LEDs, the white ones and the whole new range of high luminosity, ideal in a new field of application: lighting . As a result of this, everyone wants to use them. The problem is that, beyond its extraordinary diffusion, the LEDs are still quite delicate electronic components if not used correctly. This article explains how to measure the characteristic voltage of a led without the risk of breaking it, in order to calculate successively the resistance necessary for its operation. The characteristic voltage of an LED depends on the type and model and can vary between 1.2V and 4.5V. I clarify that the characteristic voltage of a LED is not an absolute value because it varies a little depending on the current we pass through it (as it also happens with normal diodes). For example, a white LED with a characteristic voltage of 3.6V can drop to 3.4V or even higher if the current is high. Either way, we can see that this variation is not very large and therefore we can ignore it when we do the resistance calculations. First of all we must identify which is the anode (positive) and the cathode (negative) of the led, this is important because with a high voltage, a led connected to the opposite can be broken. In the technical sheets of the LED (datasheet) the maximum inverse voltage value is called "max. reverse voltage "and we can see that in many models it is really low. I have many high brightness LEDs with a maximum reverse voltage of 5V. This means that if we connect a 9V battery to a polarized led to the contrary, the led will probably break because the maximum reverse voltage of 5V would be exceeded. Therefore, I advise to take care of this aspect. There are two quite clear signs to identify the cathode (negative) of the LEDs that are: the negative leg is shorter and second, in the body of the led the negative has a right mark (see figure). To measure the characteristic voltage of a led, we provisionally connect the resistance of 1000 ohms (1K) to the anode of the led while the cathode is connected to the negative of the feeder (or battery). Finally connect the free terminal of the resistance to the positive of the feeder (or battery). The led should turn on. Finally, placing the tester selector in the VDC position, we measure the voltage on the led with it. 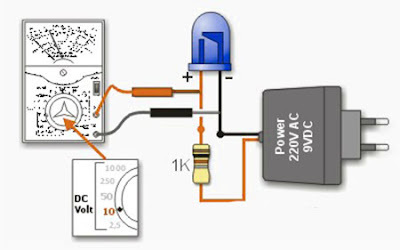 The value of 1000 ohm with a power supply of 6V or 9V guarantees that the current that will pass through the LED will never be excessive no matter which model we use. For example, in the worst case, with a red led of 1.2V of voltage and a power of 9V will pass a current of: I = (V-Vled) / R => I = (9V-1.2V) / 1000 = 7.8 mA which is quite low for any type of LED. In the past, having the technical sheets of an electronic component was a privilege reserved for few technicians while today, thanks to the Internet, in a few seconds we can find them and consult them directly online. Therefore, if we know the acronym of the LED that we want to use, I advise to look at the technical information, especially the maximum current that the LED supports and the characteristic voltage. With these two data we can calculate without problems the necessary resistance. One last thing, although if the LEDs do not burn like filament lamps, their performance declines over time. A led that works under extreme conditions (current and excessive temperature variations, etc.) will age much more quickly than a "relaxed" LED.